Saving Baikal from ecological disaster: How can toxic waste be neutralized? The ecosystem of Lake Baikal, Siberia’s largest and purest lake, is under threat from millions of tons of pollutants from a local plant. An ecologist from Moscow State University told RBTH how toxic waste from the Baikal Pulp and Paper Plant can be utilized and whether the Kholodninskoye zinc deposit really poses a threat to the lake. According to the Russian Ministry of Natural Resources and Environment, Lake Baikal in Eastern Siberia is the largest clean freshwater reservoir in the country. A special federal law and program have been approved for its protection. But, as RBTH reported earlier, the lake's ecosystem is being threatened by several million tons of toxic waste from the Baikal Pulp and Paper Plant. Mikhail Slipenchuk, director of the Department of Rational Environmental Management at the Geography Faculty of Moscow State University, spoke to RBTH about the various options available for neutralizing or disposing of the waste. RBTH: How clean is Baikal? Mikhail Slipenchuk: Putting it simply, I would say that at the moment water from Lake Baikal is clean and will remain so. The lake has an enormous volume of virtually distilled water, which no one can damage [the volume of water in the lake is 14,300 cubic miles, more than that of the Great Lakes of North America combined – RBTH]. Moreover, the law on the protection of Baikal is the only federal Russian law that concerns the safeguarding of a separate region [the Baikal Natural Territory is bigger than countries such as Germany, Finland and Poland - RBTH]. Very serious ecological restrictions are imposed on this territory. 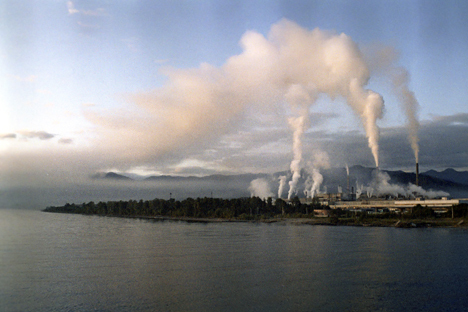 RBTH: Do you mean to say the Baikal Pulp and Paper Plant did not and does not affect the lake? M.S. The plant, thank God, is now closed. What's left are several million tons of organic compounds - lignin sludge - that is potentially dangerous. If there is a mudslide or if the waste falls into the lake [many waste sites are located a few hundred meters from the lake on mountainous terrain – RBTH], then it will be a local ecological disaster, equivalent to 100 years of pollution from the pulp and paper plant. RBTH: How can lignin sludge be utilized? M.S. : There are several proposals, none of which has been chosen as yet. The first is to use lignin sludge in the construction of roads. I have some reservations about this idea [lignin sludge, which is a dried concentrate of pulp cells that have accumulated on the site since the 70s, is a poor choice for this objective due to its toxicity – RBTH]. The second proposal is to introduce microorganisms into the lignin that would transform it into water and carbonic acid gas. However, nature in the Baikal region is rather harsh, therefore I don't know if these microorganisms would survive the winter. The third proposal, which I like most, is the plasmatic burning of lignin, since lignin is purely organic. There is Russian and Japanese technology that can turn it into slag, which can be used for constructing roads, as well as creating thermal energy. It can be used for drying the lignin, for heating nearby facilities and producing ecologically clean electricity. RBTH: Not far from Lake Baikal we find the Kholodninskoye lead and zinc deposit, which, according to Greenpeace, threatens the lake. Is this true? M.S. : This is a delicate subject for me, since I am considered an interested party: The deposit belongs to one of my companies [from 1995 to 2011 Slipenchuk was the director of Metropol, which owns the license to develop the Kholodninskoe deposit – RBTH]. The deposit is situated 74 kilometers [45 miles] from Lake Baikal. Lake Kholodnaya is a second-order lake [Lake Kholodnaya flows into Lake Kichera, which in turn flows into Lake Baikal – RBTH]. For the last five years we have regularly been sending expeditions there, in the winter and in the summer, in order to understand the impact that the deposit has on the surrounding ecosystem. The ecosystem is indeed affected because the deposit contains pits from which in the 1960s tens of thousands of tons of mercury were mined. The natural waters wash over the pits and the lead- and zinc-enriched water then flows into Lake Kholodnaya today, even without any mining. This effect is spread over 500 meters [550 yards]. RBTH: What can be done about this? M.S. : Three things. First, we can preserve the deposit, which is very dangerous, since it is already open and any flow of water could remove the plug. Second, we can create biochemical barriers, which with the absence of roads is very costly. The third and most logical option is to distance the threat by mining using ecologically safe technologies. RBTH: Why aren't they starting now? M.S. : The Ministry of the Environment has banned the development of the deposit. Three years after we obtained the license to develop it, the Baikal Natural Territory was created. The license will go into effect again next year, after which we will extend the license and protect the ecologically safe technology for developing the deposit. It would be foolish not to use the deposit, since it is strategically important: It is the sixth largest zinc deposit in the world. It means jobs and a boost to the economy of the entire Baikal region.